The hot water bottle is out and so are the oils and serums for my skin. I have hiked up the hydration levels and have been layering on the oils so that my skin isn't affected by it all. The long awaiting line of skincare products for me to test is growing by the week, but I cannot pull myself away from the things I know I love. I have spoke about this briefly before here, but Clarins Blue Orchid Face Treatment Oil* is an oil designed for dehydrated skin. It's nowhere near as heavy as others I have been using, I just wake up with silky smooth skin and not a patch of flaky skin anywhere. The oil contains extracts of Rosewood, Patchouli and Blue Orchid which help tone, revitalise and restore radiance in the skin. The Hazelnut oil in it helps prevent moisture loss, which leads to the beginning of fine lines, which no one wants. On the nights I have been needing that something more, or throughout the day when I want to heavily oil my skin up, I've been reaching for Origins Plantscription Face Oil*. It's a new release for the Plantscription range, but don't be alarmed that it's anti-ageing, it means it has extreme hydration levels too! It includes 20 oils from around the world including Raspberry Seed Oil, Argan Oil, Tamanu Oil and Evening Primrose. I am going to pass this onto my mum soon too, to see if it does help smooth out those dry fine lines. 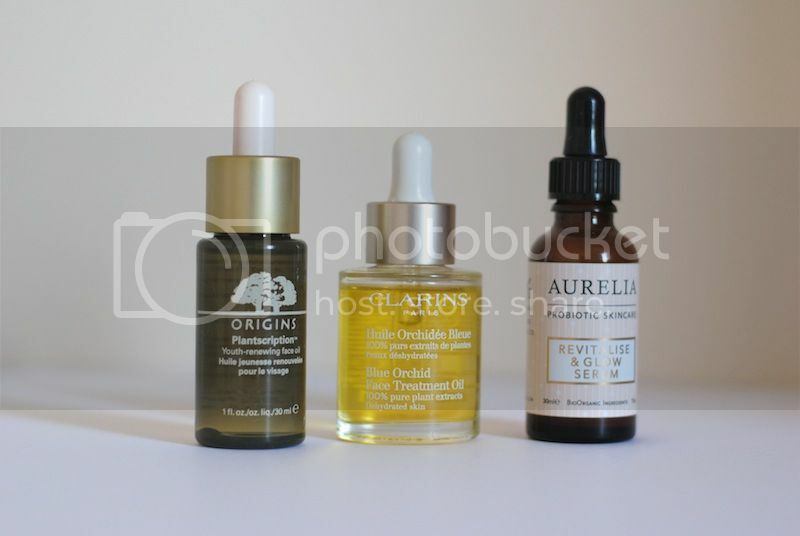 Stepping away from the oils and onto the serums, Aurelia Skincare is a brand I have only just recently been trying out. I've read quite a bit about them in the past few months and really enjoy the ethics and science behind the brand, so I was excited to try out some of their products. I won't go into the science too much as I'm going to do a full post about their products, but their serum is to die for! The Revitalise & Glow Serum* really does give you a glow. When Lucy mentioned to me that her skin had been a lot brighter since using it, I was very interested and she was telling the truth. I've been using it every day for the past two weeks and have seen a big difference in my skin. Overall, it just looks a lot more radiant. I am excited to try more products from Aurelia!